Wow! I counted almost 200 people packed into the Chaparral Auditorium in Ojai to hear renowned rainwater harvesting Brad Lancaster's talk, "Turning Water Scarcity Into Water Abundance." This Slide Show and Book Signing was sponsored by the Ojai Valley Green Coalition as part of their monthly Ecology and Community series. Congratulations to the organizers for bringing such an enlightening speaker to our watershed! The evening began with a rather dry presentation by Jim MacDonald, a Ventura County building official, about the county's new greywater codes. After hearing the bureacratic restrictions, it was not surprising that nobody in Ventura County has applied for a greywater permit since it became effective in February. Apparently there are far more effective statewide greywater ordinances in Arizona and New Mexico, something to begin to work toward in California, where the governor has proclaimed a statewide drought. Then Brad shared the story of how he and his brother converted their home, run down and destined for condemnation when they bought it in 1996, into an 'oasis' of life right in the heart of the desert city of Tuscon. The makeover was so dramatic that it grew into a neighborhood effort, with residents coordinated tree planting and stormwater capture on city right of way's, eliminating flooding, traffic, and turning the heat island streetscape into a 'cool island.' Brad also presented some great numbers on how much rainwater the impermeable street surfaces in Tuscon flush away unused in the desert city. Turning around and pointing to the seat of his pants, he says "now we can do a bun dance' with our a-bun-dance of water and the benefits that come with that abundance!" · Show you how to select, place, size, construct, and plant your chosen water-harvesting earthworks. · Present detailed how-to information and variations of a diverse array of earthworks, including mulch, vegetation, and greywater recycling, so that you can customize the techniques to your site. For those who live in coastal watersheds, these are very simple and cheap ways to create your 'Ocean Friendly Garden.' And now that the City of Ventura has committed to a 'Green Streets' program, there may be opportunities for our neighborhood communities to start cutting curbs and planting trees! 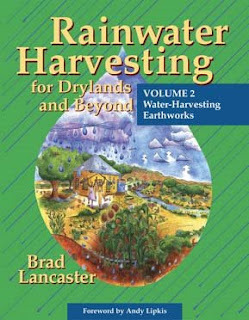 To learn more about Brad Lancaster and his work, visit www.HarvestingRainwater.com. 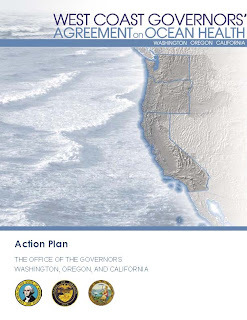 On July 29, 2008, the Governors of Washington, Oregon, and California released the finalized Action Plan for the West Coast Governors' Agreement on Ocean Health. The plan identifies specific collaborative actions between the three states to better manage the ocean and coastal resources along the entire west coast. The Action Plan addresses the following priority areas: a) clean waters and beaches; b) healthy ocean & coastal habitats; c) ecosystem-based management; d) offshore development; e) ocean literacy; f) ocean science; and g) sustainable economic development. The report is available online at http://westcoastoceans.gov/. This historic agreement provides an important opportunity for Surfrider Foundation chapters to advance our mission through leveraging our grassroots campaigns and projects with a major regional initiative. Of particular relevence to our regional efforts is Priority Area 3: Promote the Effective Implementation of Ecosystem-Based Management. Our Ventura River Ecosystem project is recognized as one of the West Coast EBM initiatives currently underway. According to the report, "Although the three states are beginning to consider EBM on a regional scale, a number of efforts along the West Coast have already engaged stakeholders, managers, policy makers, and scientists in ecosystem- level efforts at local and smaller regional levels. Such collaborative efforts have been important local drivers of EBM and are taking place in locations such as the San Juan Islands, Washington; Port Orford, Oregon; and Elkhorn Slough, Morro Bay, and Ventura, California, as well as a new effort in Humboldt Bay"
On Aug 7, 2008, the Matilija Dam "Design Oversight Group" met for an all-day meeting in Ventura. 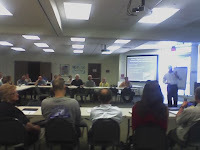 Over 40 people participated, including several property owners and interested local residents. The group was brought up to date on current schedule and funding, and discussions were conducted regarding several of the project design components. 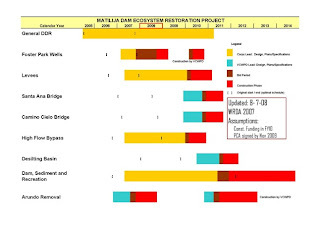 The schedule shown here represents a slight slip, with completed dam removal now scheduled for 2014. Supervisor Bennett noted that this meeting marks the beginning of the second phase of the project, and there will now be bi-monthly stakeholder meetings. This is significant, as we have recognized the need for increased information sharing and have pushed for renewed communications as the details of this complex project are worked out. It is essential for the success of this project that all stakeholders are involved as final decisions are made. The next meetings will be held on Oct 2 and Dec 4.